Many homes in Pembroke are trailers or crumbling shacks with dirt floors and no running water. Some homes feature tires up top to keep the roof from flying off, and many households have no telephone service. Until a credit union opened in 2007, there were no banks or financial institutions of any kind. Residents had to drive at least 25 miles just to cash a check. With support from the Parent Coordinator at the Lorenzo R. Smith Elementary School and the Pembroke School District’s Superintendent of Schools, Family-to-Family serves families throughout the Pembroke/St. Anne/Momence area. 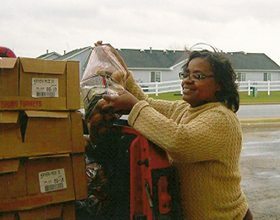 In Pembroke, Family-to-Family purchases groceries for our sponsored families from the Bradley Illinois Kmart. Sources: Population – U.S. Census Bureau, Census 2000; Poverty & Income — U.S.
Credit Union System “INDEPTH”, 4th Quarter 2008.